Garth Brooks rodeo tickets are a hot item. Get your Garth Brooks rodeo tickets today for the best selection. 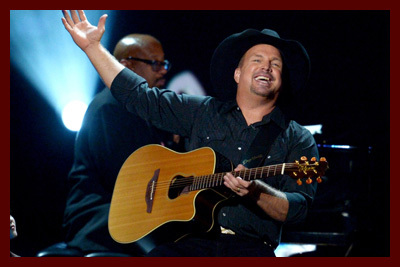 Country music singer and songwriter, Garth Brooks is making a huge comeback! Officially retiring in 2001 after 17 years of hits and 13 years in retirement; he released a new album, Man Against Machine in late 2014. The first single off his new album, "People Loving People" was released in September of 2014. His world tour along side his wife, Trisha Yearwood kicked off in September 2014. He also started a new music service, GhostTunes and joined the ever so popular social media outlets, such as Facebook, Twitter and Instagram. On October 13, 2016, Brooks released the first single, "Baby, Let's Lay Down and Dance". The first four songs are always the same. The concert begins with footage of Brooks' silhouette while singing the opening lines to "Man Against Machine". He then appears via elevator through the floor of the stage, pauses, and . The bridge and final chorus are omitted and it transitions to "Rodeo", followed by "Two of a Kind, Workin' on a Full House", and "The Beaches of Cheyenne". Next, depending on the venue, other songs such as "The River", "Two Pina Coladas", "Papa Loved Mama", and "Ain't Goin' Down ('Til the Sun Comes Up)". "Unanswered Prayers" follows, with the audience singing the entire song with little accompaniment from Brooks. Additional songs, including "That Summer", "The Thunder Rolls", and "We Shall Be Free" may follow. Excluding the opening, Brooks only performs one song from Man Against Machine, his new album (either "People Loving People" or "All American Kid"; occasionally "Mom"). Born and raised in Yukon, Oklahoma, it is surprising to find out he wasn't much of a country music fan. At a young age his family hosted weekly talent nights and all were required to participate. Garth learned how to play the guitar and banjo because of this. He received a track scholarship to Oklahoma State University. In 1984, after graduating with a degree in advertising, he began his music career. Most folks know his hits such as, "Friends in Low Places, "The Dance", "The Thunder Rolls", "Unanswered Prayers", "Two of a Kind, Workin' on a Full House", "Shameless", and "Standing Outside The Fire". He and wife, Trisha Yearwood, released the hit "In Another's Eyes" in 1997.